I recently bought a roll of coaxial cabling to do some work at my grandmother's place and thought I could use it to experimentally confirm transmission line theory. It's one of those topics that you do a lot of reading about, but you may never actually encounter in the real world. I can still remember when I was told about transmission lines and everything became clear. Of course a voltage couldn't appear instantaneously at the end of a cable. Information can't travel faster than the speed of light. The signal has to travel along the cable and to make things more interesting can get reflected depending on how the cable is terminated. I've done the math, I've done the simulations, but I still want to do the experiment. My experiment isn't anything fancy. I terminated the roll of coaxial cable with an f connector and connected it to an oscilloscope via an adapter and a BNC tee. 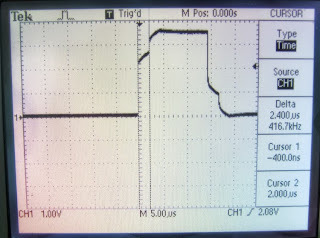 The other side of the tee was then conencted to a function generator outputting a 10 volt pulse. The other end of the coaxial cable wasn't terminated, so in theory the pulse should reach the end of the cable and be completely reflected. The waveform on the scope was observed to see if this happened. I'm not trying to take super accurate measurements, I only want to get a quick overview of the physics involved. If the experiment is simplified it can be represented as the following schematic. 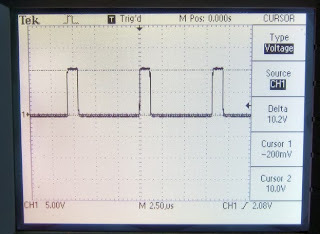 A function generator with a 50 ohm output impedance is connected to a coaxial cable with a 75 ohm characteristic impedance. 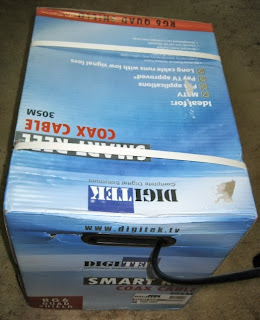 I'm not sure of the quality of my cable, from what I've heard it's average to good. It's suitable for cable television installations, so I guess it's not designed for extremely long runs, but should give decent results. 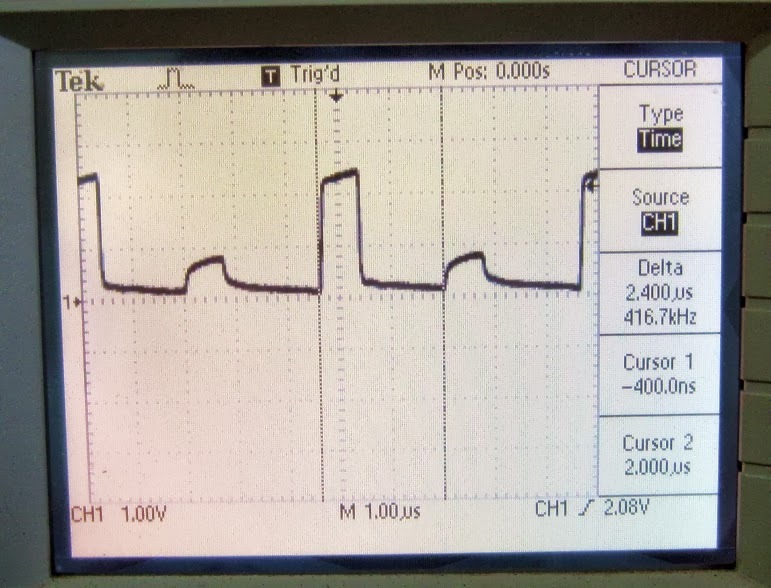 Below is the output of the generator without the cable connected. The peak voltage of the pulses is around 10 volts and they also have relatively short rise and fall times. 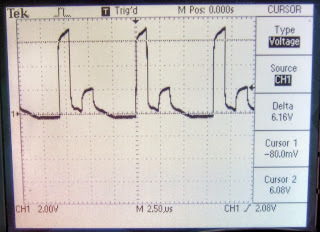 After the cable was connected a second pulse appears, this is assumed to be the reflection of the initial pulse. The magnitude of the first pulse is also reduced due to the loading of the cable. As the signal is applied to the cable energy starts to flow down it. The rate at which the energy flows down the cable can be replicated by replacing it with a resistor equal to it's characteristic impedance. This forms a simple voltage divider with the function generator's output impedance. The cable voltage would be equal to Vin*Zo/(Zo+Rg) = 10*75/(75+50) = 6 Volts. 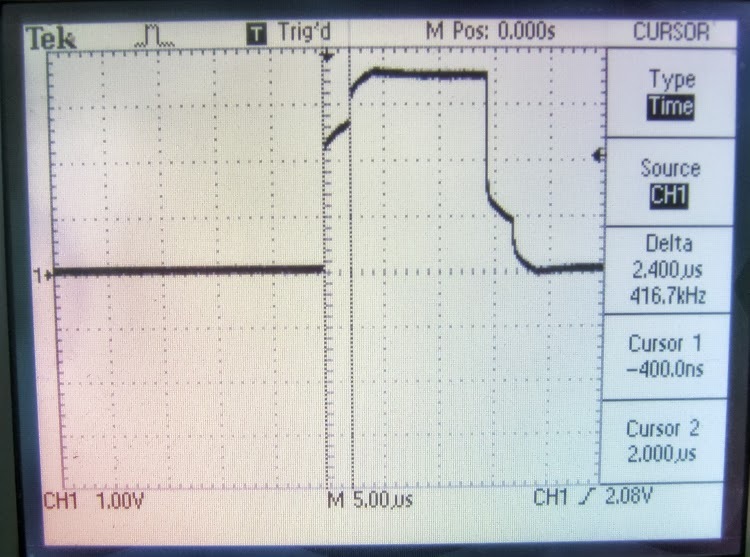 This agrees with the observed voltage of the initial peak in the screen shot below. The magnitude of the reflected pulse is a little bit beyond this experiment. Theoretically it can be calculated, but I think it needs to be simulated for a real world application like this. Simple calculations assume an ideal conductor, whereas in reality the conductor is non uniform an has imperfections. This creates small impedance mismatches all along the cable causing transmission and and reflection at each point. I think this is measured by the Structural Return Loss (SRL). I suspect that this is the reason the pulses have rising tops. As the pulse travels down the cable a portion of the signal is continually reflected back to the generator. I can't be sure without some simulations but I think this is what is happening. There's another experiment that can be easily done with this arrangement. The velocity factor of the coaxial cable can be calculated. This is how fast the signal travels down the cable as a fraction of the speed of light. 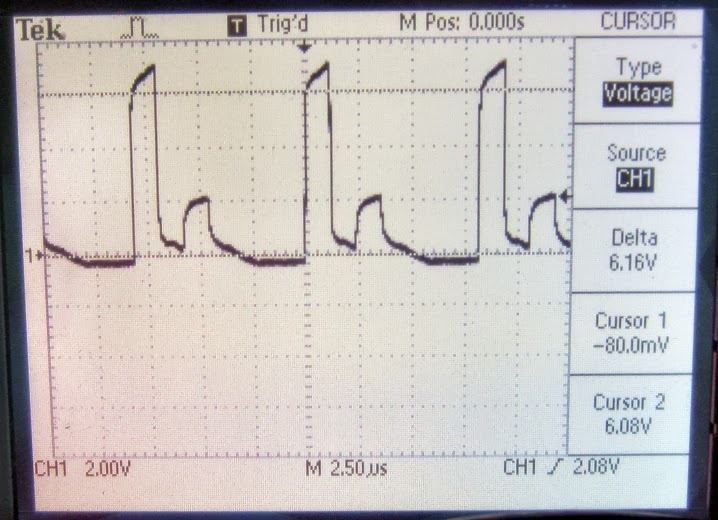 From the waveform below it can be seen that the elapsed time between the rising edge of the initial pulse and the the rising edge of the reflected pulse is 2.4 us. As the pulse had to do a round trip on a 305 m length of cable we know it travelled 610 m. This gives a velocity of 250000 km/s. As a fraction of the speed of light this is equal to 85%, closely agreeing with the 82% value from the cable's datasheet, also shown below. This confirms that the second pulse is the reflection. Another phenomenon to observe is what happens when the transmitted pulse overlaps the reflected pulse. This is show in the waveform below. As the duration of the pulse is increased, it will collide with the reflected pulse. As the reflected and initial pulses collide they add constructively. There are 3 distinct sections to the plot below. The first section is the initial pulse, the second section is the sum of the initial and reflected pulse and the third section is only the reflected pulse. I like doing small tests like this. Experimentally confirming physics principles is useful as it shows the difference between ideal models and the real world. An interesting quirk like the structural return loss of the cable is something I wouldn't have known about without actual taking measurements.